A simple review turned into an absorbing read! The book is chock-full of insight into both dogs and people. Tina doesn’t mince words nor does she overuse them. Her style is different but pleasantly straightforward, leading the reader into a story which reveals Tina Barber to be as unique, intelligent, and devoted as her Shiloh Shepherds. With no degree in genetics, she developed genetic research methods as efficient as any this breeder has ever studied. She went beyond research and theory; she applied her method and insisted that, as a breed developer, her breeders also adhered to stringent record-keeping and selection criteria. "Devoted" seems a rather weak adjective to describe her unwavering loyalty to a single breed and a single objective. Sustained by her Christian faith, the author endures enough trial, tribulation, and heartache to serve as a model to all who may feel challenged. 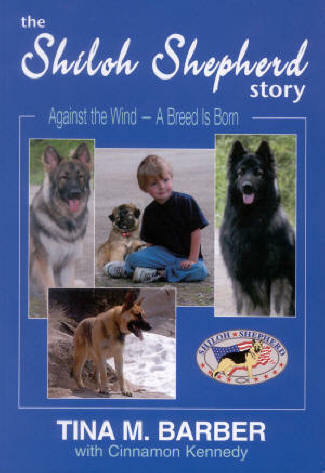 The Shiloh Shepherd Story is an adventure story and a compelling insight into human nature at its best (and worst). Did I mention emotional impact? It will bring tears to the eyes and joy to the heart of every dog lover! Suffice to say, it belongs on every breeder's bookshelf.